Unleash the power of a potent pickup when you buy or lease the 2018 Toyota Tacoma. The new Toyota Tacoma has all the makings of a capable Toyota truck, from its bold style to its excellent interior comfort. Get the job done right the first time when you have advanced Toyota driver assistive technologies, and stay protected on every leg of your journey with Toyota Safety Sense™ P features. Test-drive the 2018 Toyota Tacoma today at our Toyota dealership in San Marcos, TX! Once you’re ready to experience what a new Tacoma truck can do, visit our San Marcos, TX, Toyota dealership. 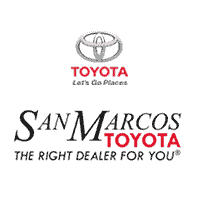 The experienced team at San Marcos Toyota is standing by to help you have a hassle-free Toyota-buying experience!